Teaching ESL, or English as a Second Language, is a great starter career for those holding a Bachelors degree… in anything! This is why you’ll often come across everyone from Art to Science majors travelling to the far ends of the Earth, with little to no experience. I started out as a Forensics and French major, teaching in Korea. No relation whatsoever! But these years of travelling and soul searching, not only makes you stand out a little on paper, but also narrows down the careers that you don’t want to do, what luxuries you prefer not to give up, and what stresses you can and cannot handle long-term. Depending on the country, ESL can get you a pretty lucrative salary or make you go broke. It can open your eyes to vibrant cultures, or make you hide for cover. The biggest impact of teaching English overseas, for me at least, is its ability to make you incredibly descriptive and creative with words… but at the same time makes you second think everything. So, below, I listed my rules to getting through your teaching year without losing yourself. At one point of your year, you will have a student who questions everything! They will hit you with a grammar question that you won’t know the answer to. I get flustered easily with these. So what I do is applaud her for such a “great” question, and “since it’s more complex, and we’re low on time, I’ll answer that tomorrow.” So to at least get me 24 hours to find a grammar wiz who knows. And as ambiguous as English is, sometimes there is no answer. Spelling “their”, “beautiful” and “guard” are the three words that I sometimes have to give second thought. I’ve seen the students spell these wrong so many times, that it starts to look right. So last month’s lesson was teaching them to use a paper dictionary, instead of asking me. Because of these grammar questions, you may find yourself questioning everything you say. “Do I run quick? Or quickly?.. If I run quickly, then why can’t I run fastly, instead of fast?”. You can imagine how these thoughts can interrupt the ease of your conversations as well. When on Skype with family at friends at home, they often catch my grammar mistakes. 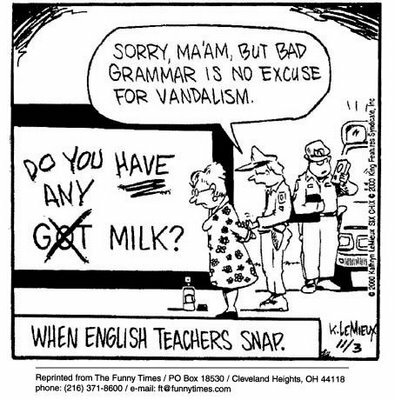 The longer that I teach English at an elementary level, the more frequent I make these slip-ups. Living and working with every type of English accent on the planet, there are often debates on correct usage of words. I am adamant on retraining my British-taught students to pronounce “Z” like “zee” instead of “zed”. Amongst us, the teachers go back and forth mocking the Queens English versus American accent. Aubergine vs. Eggplant. “At the weekend” vs. “On the weekend”. I also think I should be able to hear the difference between “walk” and “work”. From imitations, apparently all Americans sound like a “valley girl” or a “Redneck”. I’ve learned to laugh at these differences and stereotypes. Ultimately, we end up taking some of these, once awkward, phrases home with us. 4) If all else fails, play Charades, Pictionary or Taboo. I am often in situations where a picture or actions are the only way that I can get my point across. When explaining the different consistencies of water to my students, I pointed to someone’s bottle of water, drew a snowman, and then pretended to slip on patch of ice. A few of us teachers were curious about the location of the infamous “Chop Chop Square”, where executions take place. No amount of English could convey what we wanted to a nearby shopkeeper. But with the simple gesture of hand (signifying a sword) passing throat, we were pointed in the right direction. My students speak in very broken sentences. Instead of “Teacher, did you mark me late?”, they normally say, “Teacher, late?”. The easy way to get everyone’s understanding is to say, “Class, 7:30. 7:40, late.” However, this easy way out does not teach them proper sentence structure, and probably contributes to #2’s blunders. Just as, only doing baby talk to your toddler, probably wouldn’t help with their speech growth either. Being an ESL instructor will give you great appreciation for the patience it takes to teach it. Many valuable experiences have come from talking to a local with little English. However, having a girls’ night of normal conversation has helped to keep my sanity. Another big help, is to keep reading. And write! It’ll reassure you that you have some intelligence left. This entry was posted in Saudi Arabia, Teaching, Travel Writing and tagged abroad, class, conversation, dictionary, English, english as a second language, ESL, international, read, teaching, teaching english as a foreign language, vocabulary, write. Bookmark the permalink. I read a study once that talking baby talk to a baby actually does help it to progress. It makes language understandable and encourages the baby to keep experimenting, which is more important than how correct they are at that point in development. That is how I excuse myself when I hear myself say something like “You pass?” to ask a student if they’d like to pass out papers for me. At least we’re experimenting in English and not Arabic? Nice read! I like it sister…hope all is well…love you! I don’t think people should speak ‘a lot ‘ of baby talk to infants…..they are learning as soon as they are born…so every moment is teachable! Thanks for checking me out, sis 🙂 I love you too! Yeah, my nursery students understand more than I could’ve imagined (no matter the tone).